Who would’ve thought that a Jerry Bruckheimer film production of a Walt Disney theme park ride would end up being the most consistently entertaining and subversive film franchise of recent memory? Director Gore Verbinski and the bloated cast headed up by a hilarious Johnny Depp are all back for the rollicking “closing” of the “Pirates of the Caribbean” trilogy. Following the mantra of its predecessor (bigger, better, more), everything here attempts to one-up what has been seen before. With the exception of the sight gags (which are smaller and more plentiful in “At World’s End” but nothing like the mind-boggling giant wheel or log-rolling scenes from “Dead Man’s Chest”), everything else is more, more, more. There’s more characters (most notably Chow Yun Fat as the leader of a Singapore pirate gang), more plot (the double-crossings are so numerous as to make your head spin), more elaborate and wildly imaginative action set pieces and special effects (the boat flipping scene is especially good), more monkey and midget action, more jokes, more cameos (witness a seemingly un-made-up Keith Richards as Captain Teague), and most thankfully more macabre gallows humor and absurdity. Gore Verbinski has become a master of the modern action-adventure movie, finely tuning his skills here to rival an early era Steven Spielberg in his sense of visual scope. With these three films he is now an expert in the cadence of integrating computer effects with massive live stunts across sprawling set pieces. 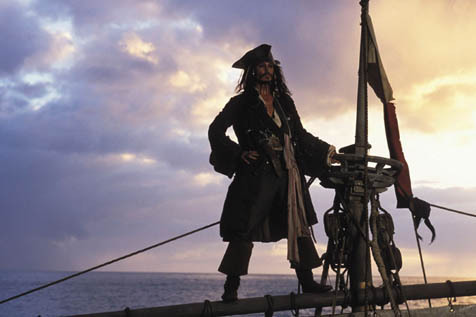 He truly deserves accolades for managing to get every character in on the action in the dazzling climactic battle between the Black Pearl and the Flying Dutchman in the middle of a giant maelstrom. There’s also one amazing scene of the British Captain going down with his ship as it is cannon-balled into oblivion that in a more serious film would seem quite epic, but in the refreshing silliness of this series is just one more over-the-top element subverting the traditional tone of the Hollywood spectacle. “At World’s End” provides more fun bang for your buck than any “third” in a series since “Indiana Jones and the Last Crusade.” It made me feel like a kid again, but being so insanely indebted to the concept of “MORE” imagining the series continuing into a fourth installment would be truly gluttonous. This entry was posted in Movie Reviews, Movies, Pop Culture.